The Brookings Area Crime Stoppers, now in its second year, is a cooperative program that brings together the Brookings area law enforcement agencies, the community and the media to solve crimes. Crime Stoppers offers citizens an anonymous method for providing vital information to law enforcement regarding unsolved crime. 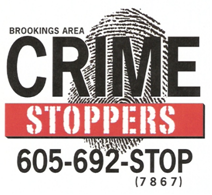 Brookings Area Crime Stoppers is dedicated to the reduction of crime, the prompt solution of crimes and to rewarding persons who provide information that leads to the arrest of those involved in criminal activity. The Brookings Area Crime Stoppers Board is made up of 15 board members and a law enforcement coordinator from the Brookings Police Department. Brookings is the fourth community in South Dakota to establish a Crime Stoppers program. In 2010, our program promoted seven “Crimes of the Week” through the media and our website. Our home page had 5351 hits and the next highest page was the “Crime of the Week” page with 1212 hits. In 2010, the Brookings Area Crime Stoppers Program received a total of 21 tips. Thirteen of these tips were received through the phone answering service and the other six tips were received through the website. Listed below is a breakdown of the tips that our program received. At the beginning of this year, we also paid out $200 to a tipster that provided information that helped solve a robbery in 2009. Learn more about texting a tip to Brookings Area Crime Stoppers.